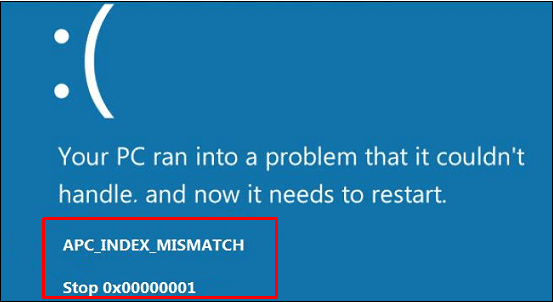 At times it so happens that we encounter a message reading APC_INDEX_MISMATCH with BSOD accompanied with a stop code 0x00000001. The basic reason for this error is a damaged or corrupted device drivers. But in a few cases, we see that graphics card might also be a reason behind the same. Though this error is very uncommon but yet few steps are designed to troubleshoot the same. There are more than one solutions with respect to this error. All the solutions are pretty simple and even a novice can go ahead with it. The time of appearance of this error is different from user to user. For some of the users encounter this error at the beginning of the booting process whilst for the others, this error pops up in between the work session.